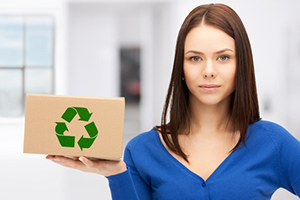 There are many reasons why commercial businesses recycle. In addition to being a great way to reduce waste collection costs, there are many environmental benefits to be considered. This can be a bonus for you and your reputation within the business and consumer community, as many Americans are concerned about the impact of local businesses on air quality and natural resources. Fortunately, a good commercial recycling program can be easy to set up and maintain, especially if you partner with an experienced service provider right here in Southeastern Massachusetts. What Should You Expect from a Commercial Recycling Program? When you sit down to plan out your company’s commercial recycling program, you need to first identify your primary objectives. Most companies want to achieve two things: the ability to reduce waste collection costs and the opportunity to reduce their impact on the local environment by reducing the amount of waste contributed to the local landfill. There are two ways that your commercial business can reduce waste collection costs. The first is by working with a reputable scrap metal recycling facility to make sure you aren’t unnecessarily creating excess waste through your common business practices. And the second is by using recycled products as a part of your business. Another more obvious way that commercial recycling can reduce waste collection costs is by eliminating recycled items, such as metals, plastics and paper, from your regular trash bins. Many companies find that they can reduce the number of dumpsters and pick-ups required each week to accommodate their company trash needs once they start recycling. There are a number of different ways that a commercial recycling program benefits the environment. It can make an impact locally on the air quality and reduced use of local landfills, but it also makes a statewide, national and global impact as well. Recycling helps to reduce the overall need for the raw materials that need to be mined or refined in order to create consumer products. This can reduce the amount of pollutants in the air, particularly in heavy manufacturing areas, and the amount of energy required to manufacture products. A good commercial recycling program in Massachusetts starts with a professional assessment of your business. Your local scrap metal recycling facility will send out a consultant to visit your site to determine how much waste material your company generates and the type of materials most commonly generated. Once the volume of these waste materials is determined, the consultant can help you to see where excess waste is occurring within your company and also help you figure out what materials can be recycled, reduced or reused. Once the assessment has been completed and the material waste or recycling issues have been identified within your business structure, the recycling facility’s consultant can work with you to set up a commercial recycling program that will be easy to follow, simple to use and beneficial for all involved. While it may take some initial education for you and your employees to make basic changes in your work routine or habits, pretty soon recycling these materials will become second nature. Bins and Containers – The scrap metal recycling facility will identify areas within your place of business that will most benefit from setting up areas for waste collection. The containers that they install will be clearly labeled to ensure that the right materials are being placed in the bins. For example, metals can be broken down into ferrous and non-ferrous metals, depending on the area of your business where they are being used. In an office setting, separate collection bins can be set up for paper products, cardboard, aluminum cans and plastic bottles. Each business and area of your business is unique and should be addressed accordingly. Waste Removal – The professional waste recycling center that you work with will then set up with you a schedule for removing the recycled waste from your facility. As you work with the consultant during the assessment and planning phase of your commercial recycling program, they will talk with you about removal options and availability. Cost and Savings Projections – Initially the consultant will give you a ballpark figure of how much you can save by implementing a commercial recycling program. Once the program gets going and actual waste begins to be collected, they will reassess the situation and show you how much you were able to reduce waste collection costs, as well as find other ways to boost your recycling program to increase financial and environmental benefits. If your business is located in Southeastern Massachusetts, from New Bedford and Fall River on out to the Cape, call Mid-City Scrap Iron & Salvage, Co. in Westport. They have the unique ability to be able to service both commercial and industrial businesses of any size. Mid-City currently partners with a wide range of businesses and industries, from local machine shops on up to Fortune 500 companies. In addition to setting up a commercial recycling program for your business, Mid-City also works with government agencies, municipalities, construction companies, fabricators and marine service companies. Whether you are a small independent contractor or a huge manufacturing company, Mid-City will provide quality, comprehensive services to help you increase your bottom line and decrease your company’s waste. Our experienced staff will visit your site and provide a thorough assessment of your facility, suggesting recycling opportunities and methods that can be employed to reduce waste collection costs. We will develop a sustainable and comprehensive recycling program that addresses the unique needs, interests and abilities of your company to help maximize your results. Call Mid-City Scrap Iron & Salvage, Co. to set up an appointment to get started on your commercial recycling program today!